Ohio was treated to two things on Tuesday night that have been absent for most of the season: a healthy Quentin Poling and a mobile Derrius Vick. Poling led the Ohio (6-4, 3-3 MAC) defense to its first shutout over an FBS team since 2004, and Vick had his dual-threat abilities on full display in Ohio’s 27-0 victory Kent State (3-7, 2-4 MAC). Poling recorded 10 tackles, including three TFL, in his return after missing three straight games with a knee injury. The sophomore linebacker also intercepted Kent State quarterback George Bollas by ripping the ball away from the intended receiver. Quentin Poling (32) led Ohio with 10 tackles in his return from injury. Vick completed 7 of his 13 passes, including a 49-yard touchdown to Sebastian Smith on the third play from scrimmage, and rushed for a career-high 107 yards on 22 carries and this 7-yard score. Ouellette added 74 yards on 13 rushes and reeled in two catches for six yards. The only other Ohio pass-catcher with multiple receptions was Jordan Reid with three receptions for 51 yards, including a 41-yard touchdown on a dime from JD Sprague in relief duty. The Bobcats outgained the Golden Flashes 447-191. The Bobcats shutout was their first since a 38-0 victory over Austin Peay in 2013 and a sharp contrast from the last three games that saw Ohio allow 50.7 points per game. The ‘Cats defense forced seven 3 & outs in the win. 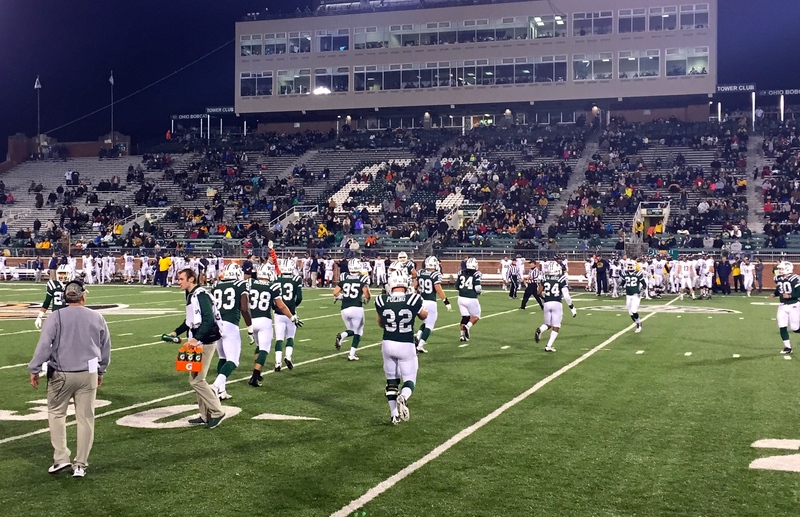 The victory makes Ohio bowl-eligible for the seventh-consecutive season. The Bobcats will conclude their home slate next Tuesday when they host Ball State.